Saturday night at the Roundhouse in Camden Town . It’s busy. In the main room, post-emo college rock band, Brand New, was pulling a heavy crowd. Meanwhile, in the small theatre, a more modest gathering was gradually assembling to get a taste of British Underground’s reggae inspired foray in SXSW in Texas in March. Building on a slow start Ras Kwame flung down a selection of tunes that illustrated the evolution of reggae in the UK from ‘My Boy Lollipop’ onwards and if he appeared dropping it inna Rodigan style that’s simply how it turned out. According to my good friend Penny Reel, Rasites hail from Hackney, and they touched down on the stage first. These second generation Rastafari musicians delivered a fast flowing set that embraced classical, live, roots reggae along with lyrical flavours synonymous with Jamaican Bobo dreads like Anthony B and Sizzla. They laid the foundation, rocked a predominantly young white crowd and fired up one crew of determined, teenage, skanky steppers. Once the Rasites set was done they settled into the role of backing band and were joined onstage by singer songwriter Natty. Judging by the audience response, this acoustic guitar toting troubadour has already got a devoted following and looks set to build on it. Lyrically, he’s rooted in the now and he’s developed a vocal delivery with an urban edge that retains a reflective conversational style. On this night, his songs were effortlessly complimented and boosted by the muscular presence of the Rasites. Following a short break where Ras Kwame berated certain sections of the crowd who insisted on talking through everything he invited onstage the final performer of the evening, the inimitable Lady Leshurr. I’d expected to hear this feisty Brummie wordsmith within a digital/dj setting but no, she took to the mic with the versatile Rasites behind her. Brimming over with confidence, this girl may be tiny but she’s destined to be large. Proud of her Midlands roots she popped off volleys of rapid fire lyrics dedicated to her home town and set the place alight with her rendition of Sister Nancy‘s ‘Bam Bam’. She sings and spits lyrics at a speed that is mind blowing. Some of it may well be totally impenetrable but a track like ‘Lego’ more than illustrates her lyrical ingenuity. In SXSW the crew will be joined by Harleden don, Gappy Ranks and cult rootsman Little Roy delivering his version of the classic Nirvana LP ‘Battle For Seattle’. All in all it’s a most interesting combination but how the UK Bass Culture concept will be received in Austin remains to be seen. 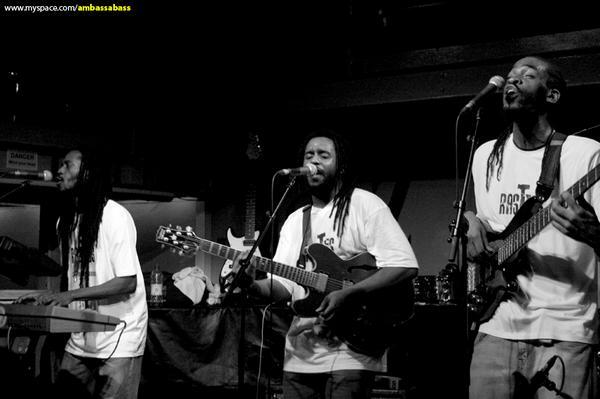 On Wednesday 15th Feb (7-9pm) @ Roundhouse Rising presents Bass Culture – The Influence Of Reggae On British Music. Swifty & I will unveil stage 1 of our our Word, Sound & Power installation that celebrates the UK Reggae Nation and paves the way for an increasingly extensive and collaborative show. This entry was posted in Urban runnings..., Words, Sound & Power and tagged Bass Culture, Channel One, Gappy Ranks, Lady Leshurr, Natty, ras Kwame, Rasites, Robbo Ranx, Roundhouse Rising, Swifty, SXSW, Word Sound & Power. Bookmark the permalink. The pre-SXSW session with Rasites, Natty & Lady Leshur was held at the Roundhouse last Saturday, the Bass Culture forum is at the the Roundhouse this Wednesday (7-9pm – 2 quid) . The SXSW session is in Austin Texas in March.